(L) Vintage T-Shirt! 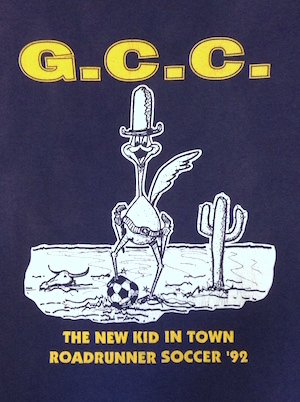 1992 G.C.C. Roadrunner Soccer! Home > Items just added 4/3-4/17 > (L) Vintage T-Shirt! 1992 G.C.C. Roadrunner Soccer! Vintage t-shirt, dated 1992. Dark navy blue base, with bright yellow, and white, print. G.C.C. 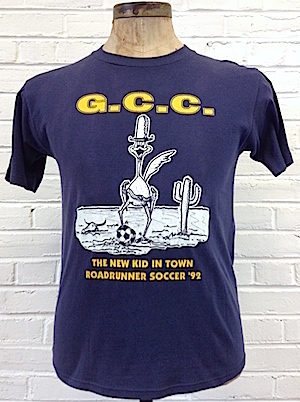 The New Kid in Town Roadrunner Soccer '92. Jerzees tag, marked size L. Washed soft. Condition: Very Good. washed soft and has a nice fade. Chest: 21" across seam to seam. LARGE. will stretch a bit.